Hi there, my darlings! 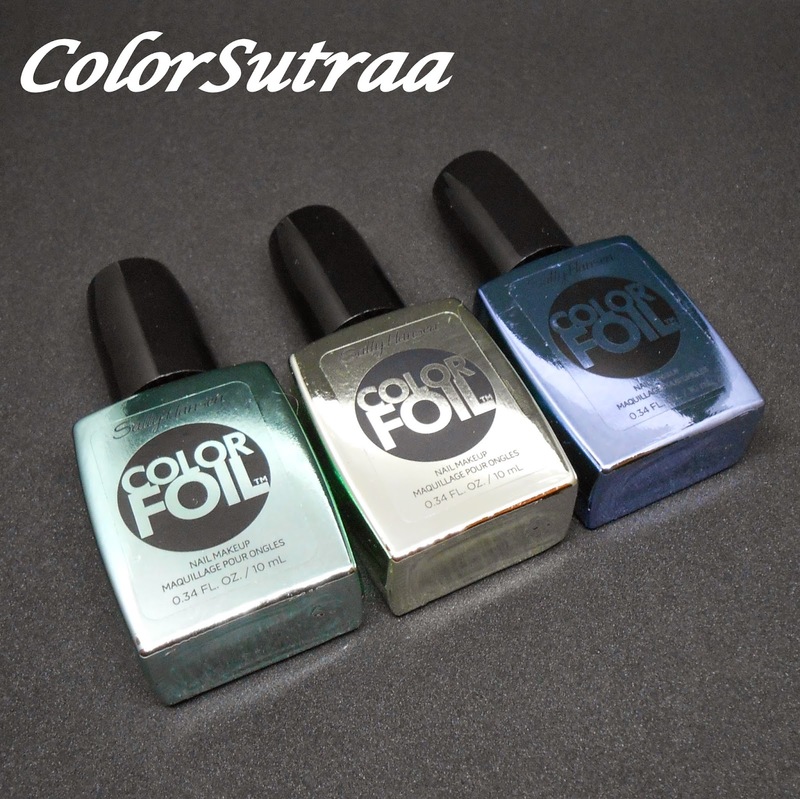 Today, I have for you my review of 3 of Sally Hansen's eagerly anticipated Color Foils collection. I was super excited to try these from the minute I saw the press release and even more excited when three gorgeous shades landed up on my doorstep! Before we get into swatches and even a little bit of nail art, let's talk about the formula--these are opaque and beautifully pigmented at one coat, yup! Just ONE coat. Not only that but they dried super quickly and applied pretty well, though being metallics, I found a generous bit of polish on the brush helped more with a smoother, less streaky application. All the swatches below are just one coat by itself, shown without base coat or topcoat, as they were designed to be worn. The only drawback to these polishes is that, if like mine, your nails are flawed in anyway, i.e., peeling, ridges, dents etc, these color foils seem to accentuate those flaws. I suggest gently buffing your nails before application. Okay then, on to the swatches! Leaden Lilac is a dusky, almost denim blue with a chrome-like, metallic finish and distinct purple undertones. Given the name, this polish was a complete, albeit totally pleasant, surprise! I love this shade of blue! Minted Metal is a minty/sea green with a chrome-like, metallic finish and a slight blue undertone. This is a green that even I would be happy to rock! Yellow Gold is a is a rich yellow-toned gold with a chrome-like, metallic finish and a hint of a green undertone. This shade reminds me so much of the burnished, antique gold jewellery that my bride-to-be sister loves! And, as you'll see in just a bit, it's a great base for a little bit of nail art! The process was fairly simple. I used a base of Yellow Gold and then applied the strips of lac decals to my nail tips. After trimming off the excess from the sides, I smoothed them down with a nail brush. 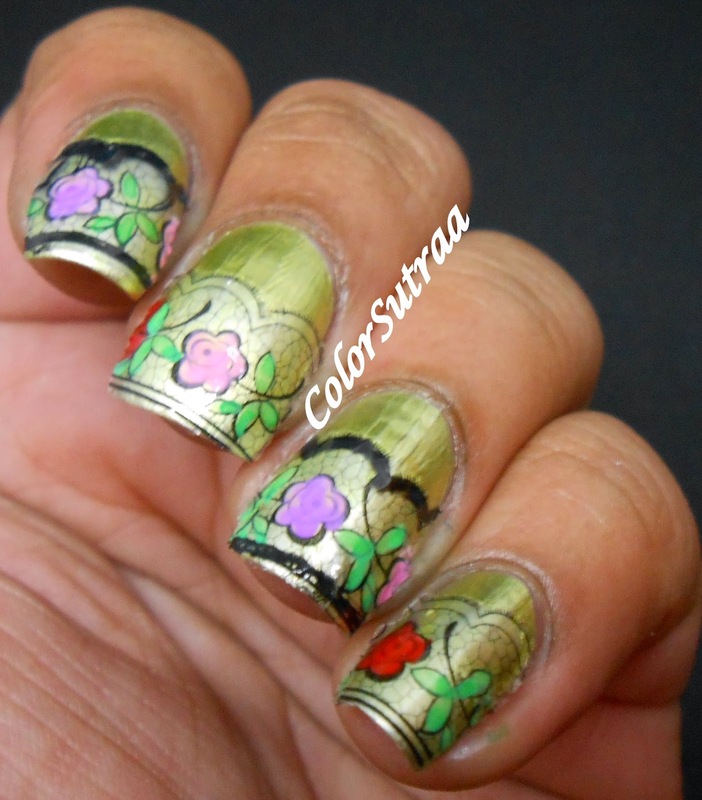 Finally, I filled in some of the areas, such as the flowers and leaves with the nail art pens. Super simple!...and here are my results! Will you be picking up any of these three to add to your stash? I'd love to hear your opinions in the comments section below! Thank you so much! These decals are so awesome!